Recruitment closed for the time being, though interested parties may send me a Pm anytime. - Themes: War, Combat, Intrigue, Diplomacy and Exploration (maybe even Trading/Economy?) in a ratio depending on Player Disposition. All of these things will be interconnected to some degree. Also, the Stakes will be raised gradually, with the potential of eventually shaping events on a world scale. It would not be a quick and easy road to get there though. - Post Rate: Around 1-2 a week. More could happen occasionally. If after a GM post seven days have come and gone without a post from a player the game will advance without them. Two strikes and you are out of the current adventure. In general I believe that slow and steady wins the race, and that PbP is not a sprint, but a marathon. You get the idea. In dusty historical tomes there are accounts of a cataclysmic war centuries ago that left huge scars in the earth and upon its people as strange powers were unleashed by unhinged Mages and wicked Prophets. The stories are all true, but not everybody believes, preferring to assume them to be made up 'tales'. For the last hundred and fifty years the arcane and magical Powers in the world were waning after being almost spent completely in this last giant wave of destructive power. Most thought they would disappear altogether, with only the old fashioned still tentatively holding on to ancient traditions of Magic. As is not always the case the traditionalist would prove to be right. The old times are coming around again – slowly but steadily. But these old times were not gentle, and neither are the new. War has hit the northern continent as the humans bicker and fight amongst each other, sending swarms of refugees south along the Broken Bridge to mingle with the other races. Tensions have also been building south, but is it also going to erupt in war? Not only are most Nations gearing up for military action, there has also been an increased activity of spies and assassins while silver tongued diplomats are claiming normalcy. Alliances shift secredly, leaving nobody sure about who is longing for war and who is fighting for peace. Adding to the hysteria a Moon turned suddenly fiery and giant is rising each night to tint the night blood red. Under this red Moon the mysterious black Monoliths that were put upon the remotest places of the Earth a long time ago by people unknown have transformed into shimmering Opal. The gemstone is emanating a mystical power that creates strange beasts on the edges of the World and draws mad Wizards near to form Death cults. Even the sane arcane practitioners near and far are tingling with reawakened power, prompted to hatch their own plans to seize this moment for themselves. Maybe most surprisingly the Gods speak again. After being silent for a hundred years, only bestowing modest powers upon especially devout followers, they have become wild again - judgemental even. First they plagued priests and seers with violent visions becoming ever more frequent, reminding them of the different laws they had installed in exchange for protection and divine might. The religious were made aware that a new age was upon them. Some believed it, some did not. The whole world knew for it to be true when a whole city was burned to the ground by one of the angrier gods, leaving only a field of glass behind. Its failing was left unknown. All this is not troubling everybody equally. Guilds and companies have sprung up that want to turn the chaos into profit. The whole world feels new, and some people want to explore and - more importantly - exploit it. It is a backwater part of the world made up of small and not very densely populated islands that band together to form a few states. Still, it is a region that connects the eastern and western continent, and has a slightly less powerful connection to the northern continent populated largely by humans. It is said that the region used to be an actual land bridge under a different name, many many years ago. It is also said that it was here that two hundred years ago the armies of the world faced off in their final confrontation, only to blast the land beneath them into smithereens. The fight expended itself then and there, with no satisfactory conclusion reached for anybody but the local carrion eaters. Armies were evacuated hastily and in an incomplete fashion, leaving lots of survivors stranded on the newly formed islands. Some had been simply too tired to make their way home. In the following years cities were formed under the lofty ideal to never give in to war again, or so the tale continues. But people forget. The Broken Bridge became a melting pot of different races that coexisted peacefully, too exhausted to continue past prejudice and hate. Some of the islands based their societies on more democratic notions, while some had Officers install themselves as Kings using the ragged remains of their last loyal troops. Vinione had turned into an island of city states loosely connected via a council that met every six months. It is considered to be a hub of trading and diplomacy, also providing much entertainment and debauchery to everybody that has the coin. It produces next to nothing besides the bare minimum of food and many many philosophers, scholars and other thinkers. But the jungle of Vinione becomes wild not far away from the coast, which had turned the people further inland into hardier and more practical men. Most city states drew much of their military from the small villages in the middle of the thick wilderness. The Kingdom of Taytomac was a different kind of beast. 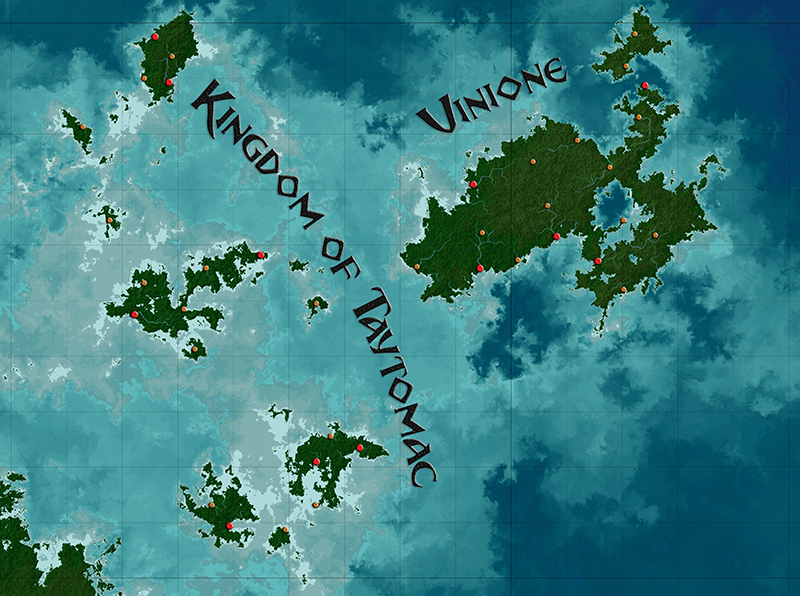 Founded by the low ranking but fierce Taytomac it had started out on only one of the smaller islands of the Broken Bridge after he had been tricked in a game of dice by the more shrewd hero Vinione. The joke was on the craftier man though, as Taytomac found a rugged country that was nonetheless filled to the brim with ores and gemstones. Quickly he installed himself ruthlessly as king, showing no mercy to those that opposed him. It was them that broke the peace first, or so Vinionians would tell you. After a decade of mining and forging weapons the Kingdom seized some of the other small Islands nearby with little bloodshed, consolidating power as it waited for the right time to launch the final strike upon Vinione. But it never came. Some say this was due to outside forces. Whispers and rumours are written down in the annals that Vinione made pacts with the scattered leftover nations on both continents to ensure its continued survival. Others simply knew the Taytomac of old to be power hungry but still wiser than most, still carrying the fear of bringing forth the horrors of actual war again that the people of the world had only left behind so recently. Whichever is the case, the now mythical Vinione and Taytomac are long dead. 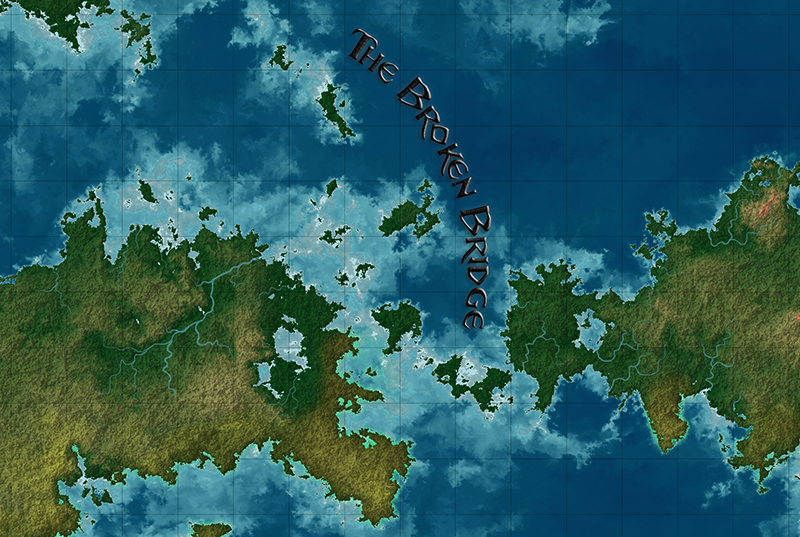 Current attitudes are largely amicable between the two most prominent nations within the broken bridge. The stirrings of the world at large have not reached them in full force yet. The problems brought forth by growing religious fervour and magical power are things both countries think they can navigate peacefully without much need to upset the status quo. What news reaches them of the lands beyond is downplayed by local government, thinking themselves upon the islands of the blessed. Many see this for the folly that it is, but they are in the minority and quickly silenced. I am looking for three or more players. I would like most Players, but not necessarily all, to design their own fantastic races to play and to populate the world. This is the reason why the setting is in a barebone state - it's up to you! Humans exist and are populous, but they are not the main inhabitants of the two southern continents close to where we will start the game. The minimum amount of custom races I will need are two, but the more the better. When thinking about races you don't have to reinvent he wheel. Being inspired by real world or fantasy animals is fine, as well as staying mostly humanoid. But I don't want carbon copies of the big fantasy races, though surely they could inspire you like they have countless writers of all kinds to work out something of your own. For inspiration you could also ask yourself: Is the race a vertebrate or invertebrate? Maybe something more exotic, like Plant based or mineral based creature? Types of Vertebrates are for example Fish, Amphibian, Reptile, Bird or Mammal. Invertebrates could be Insects, Molluscs, Crustaceans, Corals or Arachnids. You can then just let yourself be inspired by the animals, or a specific plant, or a mineral and then kind of work that into something with higher intelligence and society. Or just come up with something completely new! I don't see myself rejecting anything flat out, unless it is simply too powerful or complicated to be worked into a gaming system. Speaking of society, I'd like you to come up with one example of the society of your race. There will be many variations, in the same way that human nations are different, but starting out we want to know what the closest state is like. To get the ball rolling you may just want to think about the type of government and the economic policies. Examples of governments would be: Tyranny, Democracy, Plutocracy, Monarchy, Oligarchy, Magicracy, Theocracy, Tribal, Federal, Autoritarian etc. Economic policy could be: Capitalism, Communism, Feudalism, Socialism etc. With more details about your race and its culture in hand you can then come up with the core concept of your character in the same way you would in any other game. All characters are born and raised on either Taytomac or Vinione, so they may be more cosmopolitan than you want your overall race to be. Keep it short and simple for now. Race: The XY are a race of somethings that originated in some biome of the world. They have these physical characteristics and a temperament of this and that. Character: Name is a male/female Race living on Taytomac or Vinione, who works this job or is this archetype. They have a general disposition of this and that and like to do these things in their free time. If you want to be a Cleric or Magician of sorts you have even more freedom to design. Obviously as a priest you get to figure out which god you follow, which would probably also be worshiped by your race. If you are a magic user you can also describe the kind of tradition you were trained in or the organisation that you are a part of, which may or may not relate to your race. Gurps offers various ways of how to approach both types of magic, so how the casting of spells and miracles really works for you we can figure out together and adapt to your liking. Normal spells, wild magic, casting runes or brewing potions - all possible! Whatever we settle on will be true for your tradition or religion, with other modes also present somewhere in the setting. Race: The Sennega are a nocturnal batlike people native to the hottest jungles of this world. They are smaller than the average human, sport wide wings and survive on an all plant diet. They are inquisitive, extremely communal and empathetic. Nation: The Federation of Gulder is the largest nation-like entity for the Sennega, located within the jungles that line the banks of the mighty river Frid. Ruled by a council of elders taken from every town larger than a thousand souls they separate their society into different castes of different purposes and status. They have almost no currency, handing out wealth and food according to this caste system and personal status of the citizens. Character: Luphra is a female Sennega growing up in one of the City states of Vinione. She works as a headhunter for criminals and puts on a very gruff exterior to fight the cliché that all Sennega are friendly and naive. She also makes a point of counting every payment she receives right there on the spot, because Sennega are also often considered stupid, due to the fact they are often oblivious about money when they come down to Vinione from Gulder. In her free time she likes to bet in the Vinione arenas and sports centers, wishing to some day participate in the games herself. This would be a complete application of reasonable length. Feel free to add a few more details, but in fact I don't want a whole novel here because I would like to build up the details with the players together. Also it prevents situations where a Player has written ten pages and I have to tell them I have an issue with the core idea it was built upon, essentially wasting their precious time and effort. Short and simple is fine to start out. Regarding the rules, don't worry about that right now. I don't need sheets, just ideas. We will start the mechanical creation of the races and characters later on. At that point I will want to try out how far 150 points takes us with the characters, but may raise the amount if it feels insufficient down the road. Anybody that has no idea about Gurps, don't worry: If you can think it, we can make it. I'll guide you through generation every step of the way. When the game thread has been approved I will also most likely post a list of available skills and advantages/disadvantages to get your imagination going. Explanation to what they actually do I'll give out privately to those that lack access to the books (but remember, a lot is covered in the free Gurps Lite). Deadlines et cetera As far as I am concerned there is no deadline for applications. Unless I am seriously misjudging potential interest everybody that wants to get in will be accepted as well, up to a maximum of six players. So at some point after three applications I'll start to work out the kinks with you. If more people are up for it the mode of recruiting may change. Also note: As with all of my projects I am looking for players who will stick around a while. It's supposed to be an open ended game with a lot of freedom and player input, hence there will be a longish preparation time in which we sort out the races, the world, the goals of the characters and so on and so forth. If you want to apply today and start the adventures tomorrow this game's pace might not be for you. Last edited by Phettberg; 04-17-2019 at 06:48 AM. Last edited by Humble Athena; 02-13-2018 at 09:07 PM. Might be interested. Give me time to think. @Humble Athena I used the VP Planet Generator, a fractal map generator. It has the upside that you can zoom in pretty much indefinitely. You just hold on to the number of the random seed and can always come back to focus in on a different part of the map. For this I rendered the parts that i wanted in multiple colour profiles the generator offers and with different sized grids to combine them in Photoshop to get the look I want. Then I just painted on some things that the program is not able to do, like deserts and rivers, and slapped on the captions. Last edited by Phettberg; 02-14-2018 at 11:10 AM. I'm interested in this game, though I don't know how much world-building I can contribute since I've got several of my own worlds that need the same. Posting interest. This looks awesome. @Humble Athena As I wrote somewhere above, if you want you can outsource most of it to me. I'd be fine with a basic outline like the one in the example, and then I'll expand a little and bounce those ideas off of you. In any case the starting descriptions need not be extremely detailed or long anyway - as I am a believer in show, not tell. It's not as fun to read endless pages of descriptions as it would be exploring those places as your characters. This goes for all potential players. While I will work out the race and culture with you as much as you want not everything will be immediately put on display as a giant wall of text. The player in question and I will know, with the group as a whole potentially finding out more in the course of the campaign. The level of starting detail is totally up to you. Maybe you'll want to work out most things during play, maybe you want more preplanning - I don't mind either way. I am interested as well, but I'll need to think a bit. The first thing that came to my mind was a Satyr, but I don't know if I want to try to play one. I like Magery as well, so I'll have some consideration to do. We'll see what gels. I would probably want to be a traveling swordsman from some sort of warrior race. Will not having magic powers leave me too weak, or is there plenty of room for swords as well as sorcery? Welcome newcomers! A game thread has been created for me already, and I am preparing some informational material. Once I get some first draft Ideas I may get everybody over there to delve deeper into the designing process. @Ericg1s There is no need for magical abilities, so only go for them If you actually want them. On the one hand I will fit the adventures to the group in such a way that everybody has a chance to shine, on the other hand I don't think there is usually a massive power gap between a wizard and a swordsman, especially starting out. That is, not if you are aware of your own capabilities and limitations as well as the magicians. Sure, there are some really nasty spells, but even at higher levels there are still ways to level the playing field. Number one being to club the mage before he can release them I guess. A character that only does melee combat extremely well always has their downsides, but so does any specialist. You could also always know how to use a bow or crossbow too if you do not want to be left completely vulnerable to ranged attacks. Or design the race in such a way that it alleviates some of the inherent weaknesses of a dedicated swordsman. @galen Nice to hear you are interested. While I enjoy Satyrs as well, I would not want you going in to try and replicate a preexisting race completely. Something inspired by Satyrs would be great though. Either the body or the mind should be changed enough to make it a variation on the theme - so maybe a severely serious and businesslike race of goatpeople could be alright, or a playful bibulous race of pig-people tricksters. But a race that looks like and acts like satyrs... gurps already has the rules for that, and i wanted to avoid just picking stuff out of the sourcebooks. One of the advantages of GURPS and the 'build things brand new each time' approach is that the power imbalances of the class system are a lot easier to tweak away. If the wizard consistently outshines the swordsman, then the next 5 CP earned can be used to design a super-awesome technique for the swordsman, for example, while cramming more spells into his brain might start costing the wizard more. Interested. The first thing that came to mind for myself is a shade. As far as classes, Idk. Feels malleable in execution. Probably easier to go for a fighter class.